Remember Pink Bunny*? 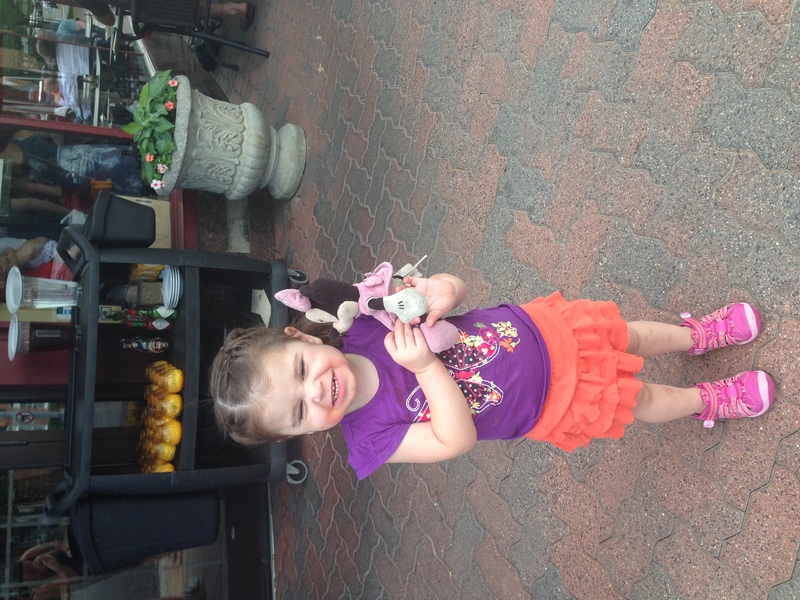 Pink Bunny is still dearly loved, but his place in Lulu’s heart is now shared with Minnie Mouse. Minnie Mouse has lost one of the bows on her shoes, and her dress is not nearly as pink as it once was. Her fur is velveted from wear, and she has taken more than one spin through our washer and dryer out of necessity – it is dirty work being dragged through daily life with a 2-year-old. Minnie came with us to Washington, DC this weekend. Hypothetically, Minnie is a better travel lovey than Pink Bunny, because we could get a replacement at any Disney Store… but as detailed above, our Minnie is less of a twin to those Disney store options at this point, and more of a distant cousin. Which is not to say that Lulu wouldn’t like a brand new Minnie – it just would not be the same. It would definitely NOT be her Minnie Mouse. Which is why I had a moment of anxiety when we lost her. 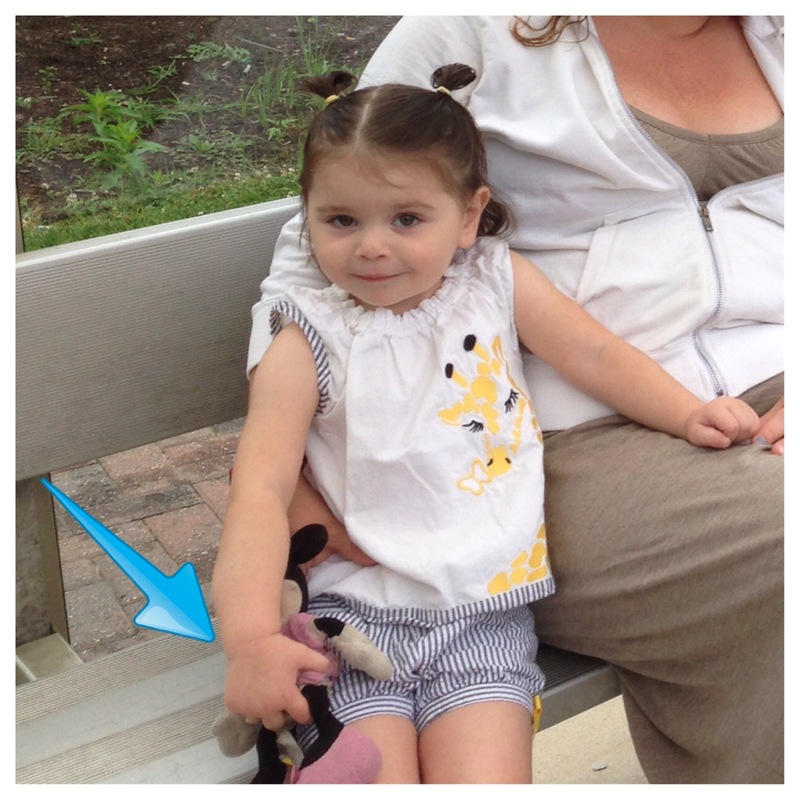 Lulu was super excited to be taking “a ride” on public transportation, and left Minnie at the bus stop. I was focussed on getting my actual children situated so by the time we noticed Minnie was missing, we had pulled away. We were taking the bus from Alexandria, VA in to DC, where we were meeting Aunt Rebecca for brunch before being tourists for the day. Going back would have meant navigating unfamiliar bus routes and sticking Adam with both kids for much of the day while I went on a lovey rescue mission: less than an ideal prospect. I immediately sent out a sort of stuffed animal Amber Alert on Twitter and Instagram, but was not having much luck. I checked Google maps and called a restaurant that was right next to the bus stop, but they didn’t open until dinner and were not answering their phone. Our hosts came up with the name of another restaurant, about half a block from the bus stop and I waited anxiously on hold while the manager there went out and got our wandering adventurer. Paul from Rhodeside Grill is our vacation hero. We can’t thank you enough for taking the time from what must have been a busy shift (weekend lunchtime in a sports bar during the World Cup? Hello!) to rescue a random little girl’s stuffed animal. 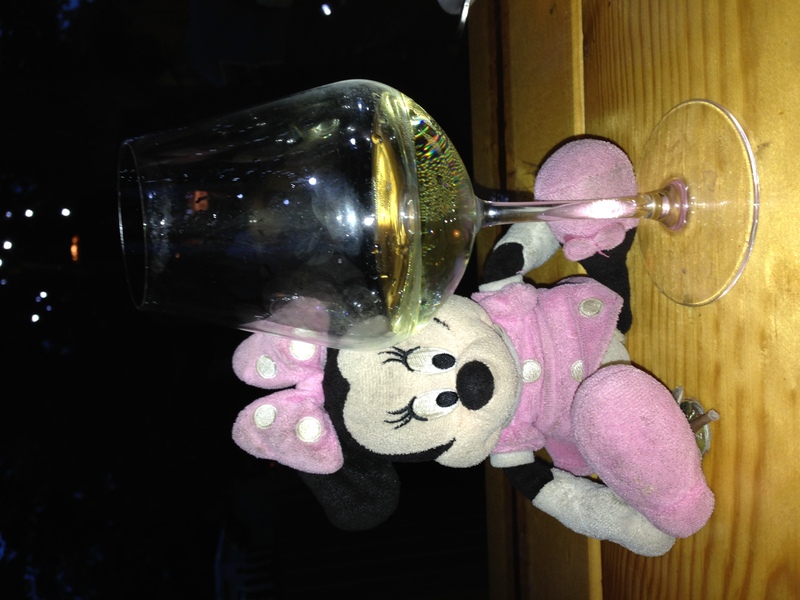 It may seem ridiculous, but it saved the day – and night, because Lulu sleeps with Minnie Mouse! If you’re in the capital area, visit the Rhodeside Grill in Alexandria – you can check out the infamous bus stop, site of Paul’s heroism, across the street on Clarendon Boulevard. *I went to find the Pink Bunny post to link here, and – wow! – Pink Bunny is looking pretty ragged these days, too. He’s a more muted color, and his flower might not be as perky… Also? Look at my BABY. When did she get to be such a big girl?! How awesome is social media! What a different world we live in. 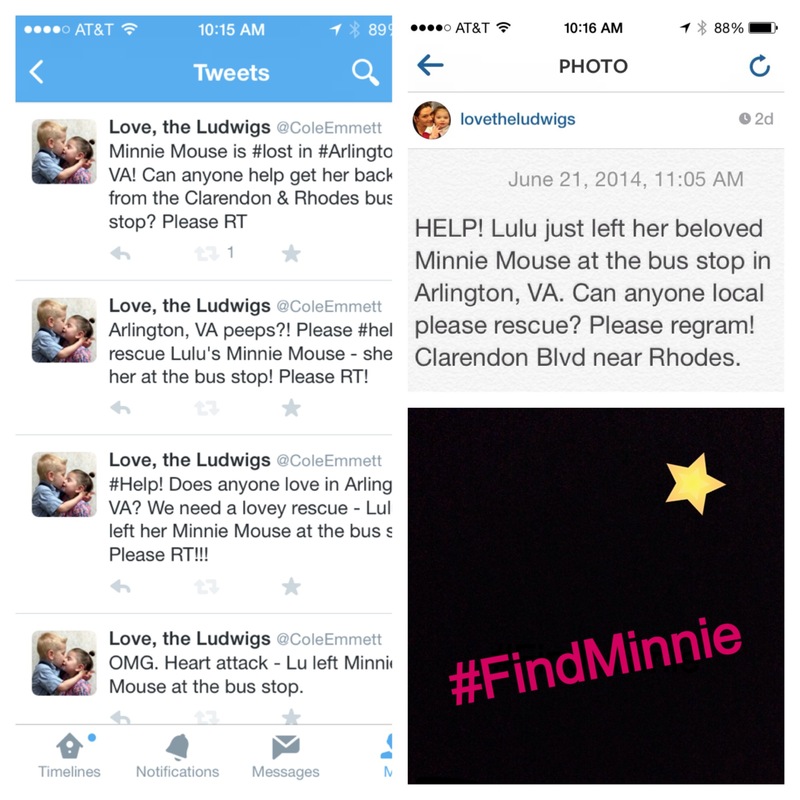 So happy that Minnie is safe! I know. I wonder if the manager has kids because I don’t think he understood quite how psyched I was that he found her! Love love love this! It lets you know, there are awesome people in this world, who will take time out to rescue a little girl’s lovey. Glad that Minnie’s back home! I was so, so grateful – we would have had a VERY sad little girl at bedtime! What an amazing story! LOVE that it has such a happy ending! We have this blue puppy lovey that DS sleeps with for all naps and every night, he’s also 2 1/2. This thing is so worn in, received as a shower gift when I was pregnant. He LOVES it! We call it Snuggly Bear (it took us a while to figure out it was a puppy, not a bear – oh well), he calls it Bee. I became worried about him ever losing his precious Bee so I went online to buy a back-up, of course it was no longer in circulation but I did find one on ebay! We now have Suggly 2.0 as a back-up. DS knows the difference though, but 2.0 will suffice in the event that Bee is in the washer – or God forbid – ever lost. In addition to Minnie, Lulu has Pink Bunny – and I live in fear that he will get lost because I can’t find a spare ANYWHERE. At least we could get Minnie at any Disney store – even if it would be different because of all OUR Minnie’s worn spots… Maybe rotate Snuggly and Snuggly 2.0 so they get even wear? What a great story of kindness. I LOVE that they were willing to go on a rescue mission. How nice! I’ll definitely stop by if we are ever in the area!